WELCOME back 221 fans. Hope all of you had a safe, fun summer and are ready for some cooler weather? Leo and I want to once again Thank You for all the kind Email you guys and gals have been sending. And Thank You for your business. Leo and I plan on doing this QOW on the 1939 and 1940 AF series GOLDEN GATE EXPOSITION machines. Then another on the DECEMBER 5, 1939 machines that will cover the 1939 CRINKLE. 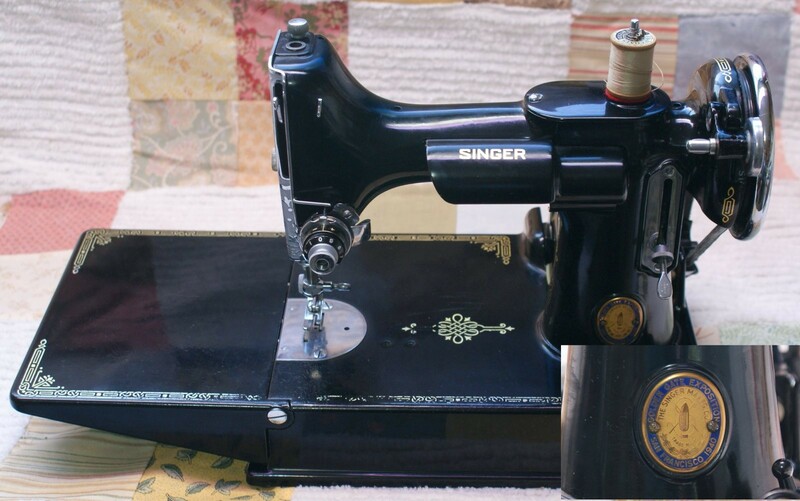 BY October 1938, Singer has had the FEATHERWEIGHT out for exactly five years, with a production of about 186,000 AD and AE machines. These were still very rare and mostly unheard of machines. Even looking at the April 1935 and 1940 Singer ads the machine was simply called a SINGER PORTABLE. 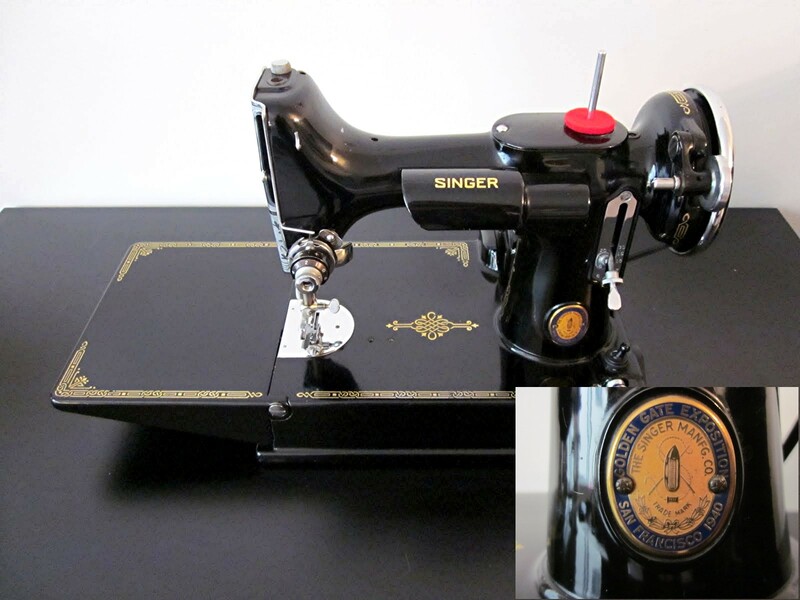 I'm sure for almost everyone who walked up and seen the SINGER PORTABLE machine for the first time, it was a complete surprise. 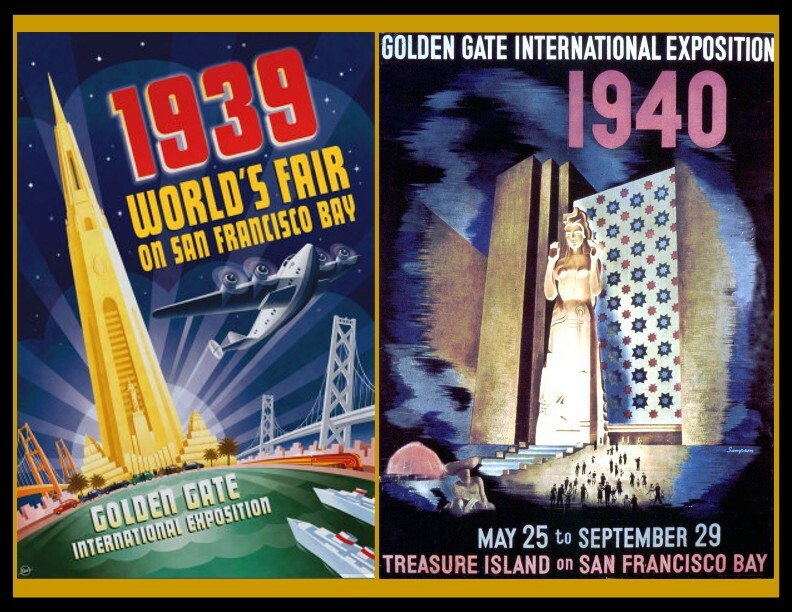 The GOLDEN GATE EXPOSITION was held very much like the CHICAGO WORLDS FAIR, except San Francisco wanted to show off two bridges built during the heart of the depression. The Oakland Bay Bridge and the Golden Gate Bridge, in which the Exposition was named after. The first part of the exposition opened from SATURDAY, FEBRUARY-18-1939 to SUNDAY, OCTOBER-29-1939. 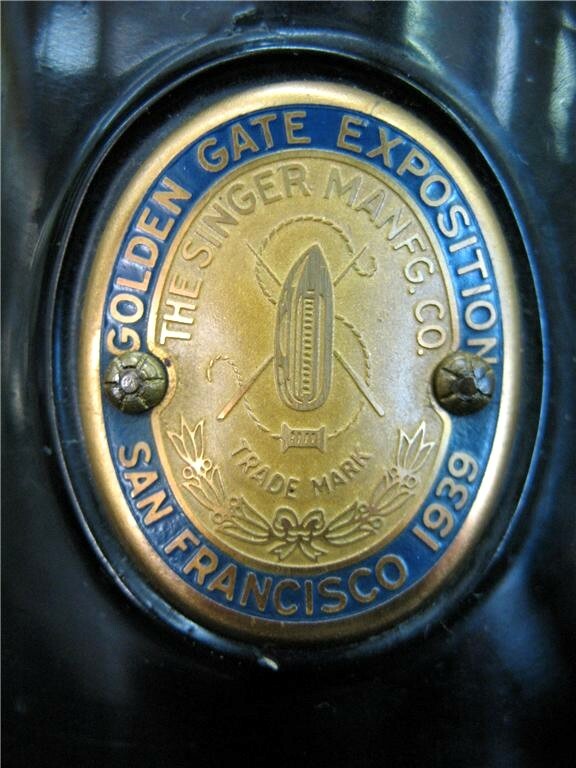 SINGER by this time was well practiced with two other major world fairs under their belts. This time Singer showed up with the newly released AF SERIES, AF070706 to AF090705 machines that had just come out on OCTOBER-10-1938. The fourth one down belonging to our collector friend, CHARLES in MARYLAND. And one to our friend EVONA in OREGON. IF a reader sees one on the above list that they now own, or if you own one not on the list, please let Leo have your name/serial number so we can build a data base? BY looking at the serial numbers, you can see Singer pulled these machines pretty early in the first production run of October 1938. The machines for the 1940 part of the Exposition would not be so organized. OCTOBER 29, 1939 the SFGG Exposition would close and would not reopen till late May-1940. The machines with the 1940 badge, by looking at the serial numbers, looks like they were picked from the production line at random to replace one's that were sold. They run in no order at all. We have only five in our data base, or a whole total of ten 1939 and 1940 badges. Is it really possible that Singer only sold 10 Featherweights at the Expo, or are there many more waiting to be found? Our collector friend LYNN ROWE owns the fourth one down and our good friend PAM ELLIOTT owns the bottom one. IF you own one of these fine machines, Leo and I would like for you to get it into our data base? That is the only way we will preserve the history of these fine and rare machines. You may notice we have yet to write an article on the Chicago Worlds Fair 221. We desperately need to find one with a 1933 Badge. Is there even one out there?